Celebrate Plant Day by taking the time to be in the moment and look at the beauty of the plants around you. Think about the nutritional benefits from plants and consider starting your own garden.... Food for thought. Earth Day is a day that is intended to inspire awareness and appreciation for the earth's natural environment. Did you know that it is celebrated globally by more than 175 countries every year. Celebrate today b taking your moment to appreciate the earth. Happy Earth Day!! Introducing The Recycling Partnership's signature webinar of 2019: How to Fight Contamination. Every other month, Partnership staff will feature recycling program managers from across the country who have successfully implemented contamination-fighting protocols in their communities. Join to learn about updated data and metrics from our optimization work, free resources available for your program, and firsthand experience of what's working in communities across the country. 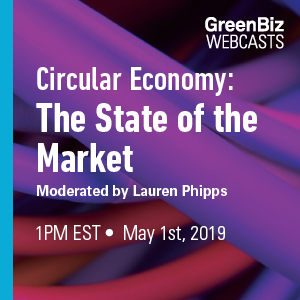 In this one-hour seminar presented by GreenBiz Webcasts, you will learn about how and why Circularity is not just a framework, but an up and coming business strategy that helps businesses and organizations to address resource scarcity and climate risk, and also respond to consumer and societal pressure to reduce waste and unlock a $4.5 trillion economic opportunity.